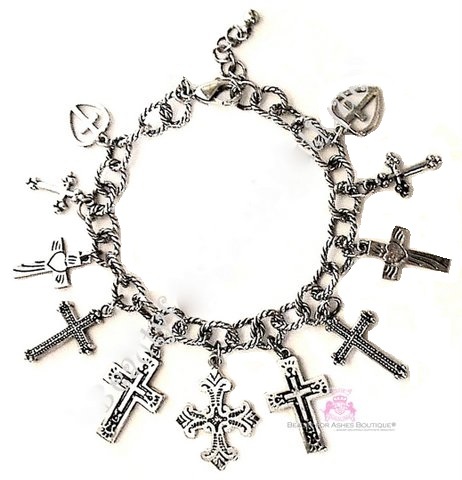 Beautiful cross charm bracelet features 11 cross charms, slightly graduating. The oval cable design link bracelet measures 7.5 inches plus a one inch extension. The base metal is brass and the plating is a very thick layer (3mil) of rhodium which is white gold) It is very strong and durable. The cable links are 1/4 inch wide and teh cross charms are 1 inch or slightly smaller. Bracelet links are large enough to add charms to! The closure is a lobster claw clasp, allowing to clasp it much shorter if needed. A small heart charm with BFA stamped for Beauty for Ashes Trademark is located at the end of the bracelet.